Join Four Seasons in supporting the Ryan P. Ginther Memorial Hike from Georgia to Maine! If you ever met Ryan Ginther — even briefly — you remember it. Ryan had a personality that was larger-than-life, a knack for telling stories, and a hearty belly laugh that made you think you’re funnier than you really are. On December 5, 2015, Ryan’s life came to a tragic end. He was killed in a car accident at just 35 years of age. I lost my best friend of 25 years that day. I also lost a great hiking partner. Since moving to the South, Ryan and I developed a mutual affinity for hiking. We’ve hiked many of the popular spots together and frequently talked about hiking the Appalachian Trail. Sadly, Ryan died before we made it out on the AT. To honor Ryan’s memory, I’ve committed to hike all 2,190 miles of the Appalachian Trail — at a pace of one week per year — through 2040. Ryan’s with me every step of the way, as I carry a small urn of his ashes in my pack. In 2017, we covered 116.6 miles of the AT from Amicalola Falls to Winding Stair Gap. In 2018, we covered 88.7 more miles, ending at Clingman’s Dome. This year, we will cover another 100 miles to finish up in Hot Springs, NC on April 20th, Ryan’s birthday. 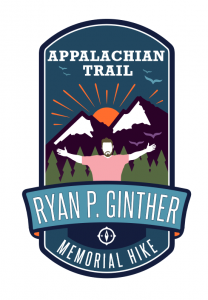 Each year a group of Ryan’s family, friends, and loved ones join me for a day of good food, hiking, and storytelling at the Ryan P. Ginther Memorial Hike. This year’s hike will take place on April 20th at 10 am at Lover’s Leap in Hot Springs We hope you can join us! Each year we raise funds and awareness for a non-profit organization. This year we’ve partnered with Camp Heart Songs, an overnight camp in the North Carolina mountains designed for children and teens who have lost loved ones. Camp Heart Songs is a two-day overnight camp that allows children ages 6-12 to express their grief in a fun and safe environment. Some of the activities offered at camp include: swimming, rock wall climbing, arts and crafts, therapeutic small groups, pet therapy and games. Ryan’s son, Noah, attended Camp Heart Songs last year and is registered again this summer. Please join us in raising funds for this worthy cause and help a child in their grieving process. Thank you for your generosity.